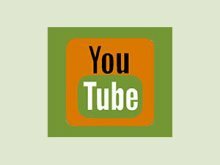 These are our top favorite raw vegan chips and cracker recipes that are delicious all by themselves, spread with seed cheese or dipped into a pâté, salsa or guacamole. They make a great alternative replacement for the traditional commercial bagged or boxed chip or cracker brand and provide the perfect transitional food for those addicted to fried potato chips, corn chips and flour-based crackers. If your used to eating some of these highly processed snacks, it might take your taste buds a little time to adjust to the natural flavors of the simple whole food ingredients these recipes are made from. But, we guarantee they can be just as enjoyable and full of flavor as some of your favorite savory and salty snack foods. Most store-bought crackers and chips are high in refined oils, partially hydrogenated vegetable oils, trans fats and have been unfavorably altered by a high temperature baking or frying process. Although these crispy and crunchy products might seem harmless, when they become are regular part of your daily food intake they can cause long term side-effects and potential inflammation-related issues further down the road. In a study published in the American Journal of Clinical Nutrition, it was shown that chronic intake of potato chips induced a proinflammatory state and increased the risk of conditions like atherosclerosis. All salty foods and even nut and seed based chips and cracker variations should ultimately be consumed in moderation, along with a health promoting diet and exercise program. This is not to say that we can't over-indulge from time to time. 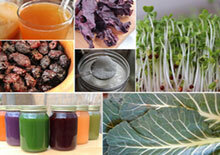 It's ultimately the foods we choose to consume on a regular basis that matter most from a health standpoint. When we use oil in these recipes, we use the good fats like raw unrefined coconut oil which is more stable to dehydration temperatures and, although it's a saturated fat, is composed of medium chain fatty acids. These fats are more easily absorbed by the body and are more likely to be converted to energy, not stored as body fat. In addition, we don't use iodized or refined table salt in our chips and cracker recipes. Low quality salts are known to be made up of about 97.5% sodium chloride and 2.5% toxic substances like aluminum silicate, silicon dioxide, calcium silicate and other anti-caking agents. 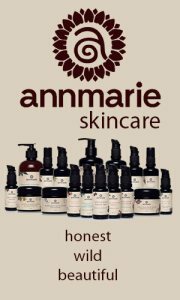 Mineralized sea salt or rock-based salts are far more nutritious, containing natural nutrients and trace minerals the body requires. These recipes are not baked or deep fried but made in a dehydrator and dried at a medium heat setting or, for optimal nutrition, below 118° F (48°C). We use an Excalibur dehydrator model as they have slide out trays that are very convenient to use for chips and cracker making. If you don't happen to own a food dehydrator you can use the old school oven-drying method by turning the heat on the lowest setting and leaving the oven door cracked open. We don't promote baking these recipes as you will loose a significant amount of nutritional quality and enzyme content. Raw dehydrated chips and crackers have a long shelf life and, when appropriately dried and stored, can last for many months in a pantry or cupboard space. Cheesy kale chips are by far one of our most popular recipes as they are quickly becoming more well-known among mainstream audiences worldwide. 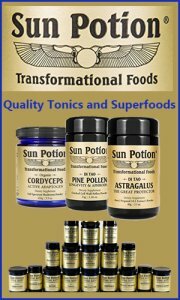 They were originally invented about 10 years ago and produced commercially by the raw food company Alive and Radiant Foods. Many people today, however, are learning how to make homemade kale chips for way less money than you might want to pay for expensive kale chip products. You can literally make the chips from 3 big bunches of organic curly kale for the same price as a small kale chip bag. This recipe is our cheesy kale chip variety, but we also have a few others, like our crispy curried kale and our pepperoni pizza kale chip, which we will share on future recipe pages. For now, the most basic and much love favorite among children and a wide range of people is the cheesy kale chip. It is created by massaging fresh kale leaves with our brazil nut-based cheese sauce and dehydrating them for 7-8 hours. 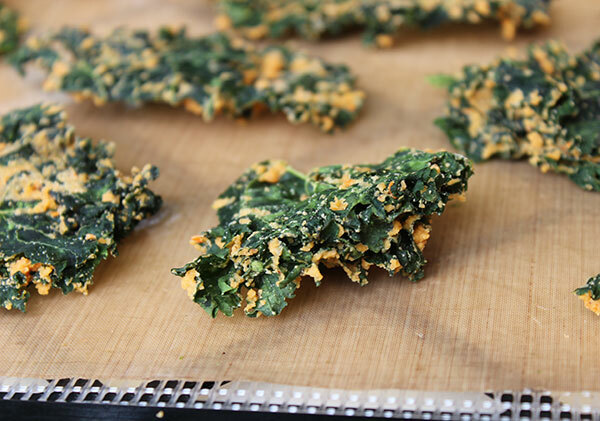 On our kale chips recipe page we'll give you some tips and tricks for creating a full-proof kale chip ready for boxed lunches or a quick and satisfying mid-day snack. 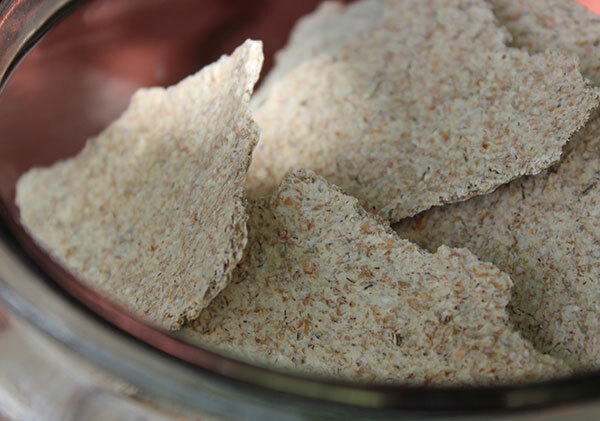 Flaxseed crackers are one of the original dehydrated chips and cracker recipes created by early raw vegan chefs back in the 80's. Because of the nature of the flax seed and its gelatinous consistency when soaked, they make a particularly light and crunchy cracker. This flax mixture is also very easy to work with and spread onto a dehydrator tray with a spatula. 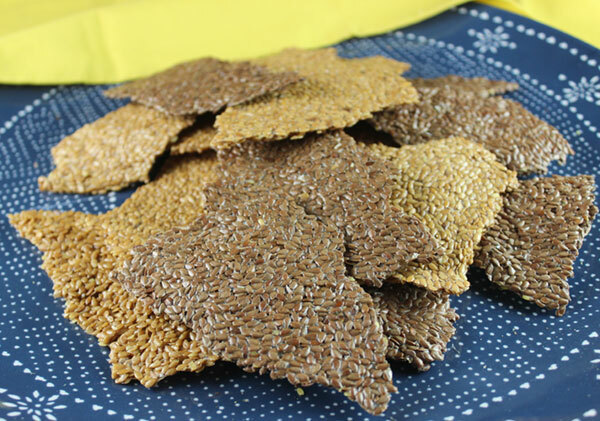 This is our simple flaxseed cracker recipe made with soaked golden and brown seeds and four basic ingredients. 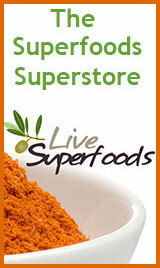 They are low fat, gluten-free, full of fiber and completely raw vegan. They are great to have on hand for dips, hummus, seed cheese, soups or are delicious all by themselves. You can start with this plain recipe or we also give a number of other alternatives to expand on taste preferences and flavor themes. Our recipe makes about a one-gallon glass jar of crackers that will last for many weeks when store in a cool pantry space. 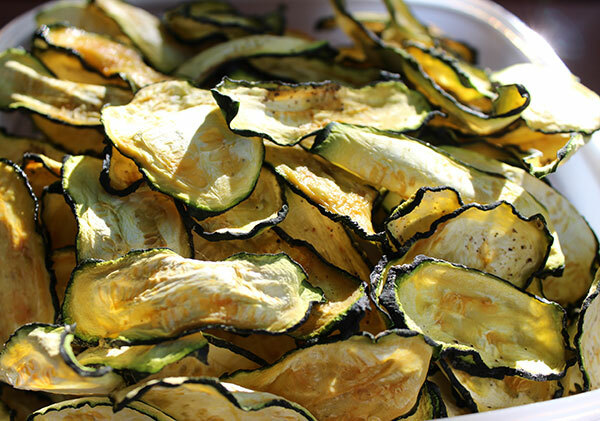 This is our basic squash chips recipe utilizing any type of tender summer squash or "courgette" variety. Squash, like zucchini, make perfect chip shape pieces when sliced with a mandolin slicer or food processing blade attachment. If you happen to have your own garden, our recipe is a great way to use up freshly harvested squash that tends to grow quite prolifically in the summer season. Squash contains alot of moisture content, but dries very fast, within 6-8 hours, producing a crisp slightly chewy chip that has a deliciously sweet flavor. We lightly brush on a little coconut oil, salt and pepper for a plain chip variety but also tend to spice them up with other seasonings for a slightly different taste sensation. This recipe is highly versatile depending on your personal preferences and what you are trying to replicate. They made a great BBQ chip when sprinkled with smoky mesquite spices and sweet tomato flavorings. This basic recipe, however, goes really well with meals, soups or sandwiches and makes a satisfying replacement for the traditional potato chip. On our recipe page we also give another alternate way to make them by processing whole chopped squash along with other ingredients and chia seeds to create a round crunchy cracker rather than a chip. 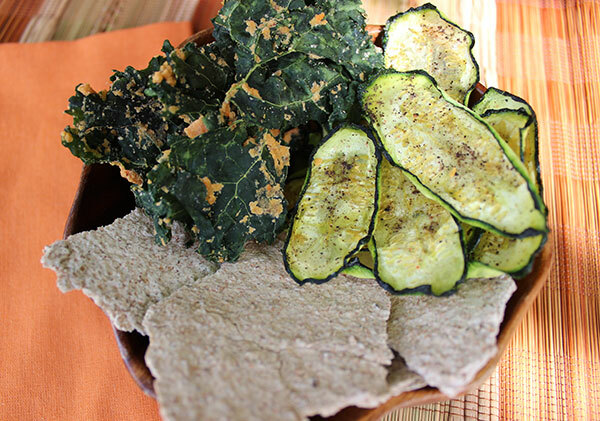 This is our raw nori nachos recipe made with nuts and seed cheese sauce spread onto untoasted nori sheets. 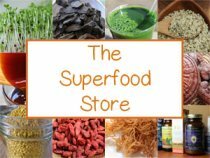 One raw vegan company in the last few years, as of 2016, has been selling these packaged snacks with great success. So, buying them premade is always an option. We, however, prefer to make our own as they don't really take much time to prepare and provide a convenient and nutritious snack food that is filled with the health benefits of nori seaweed. 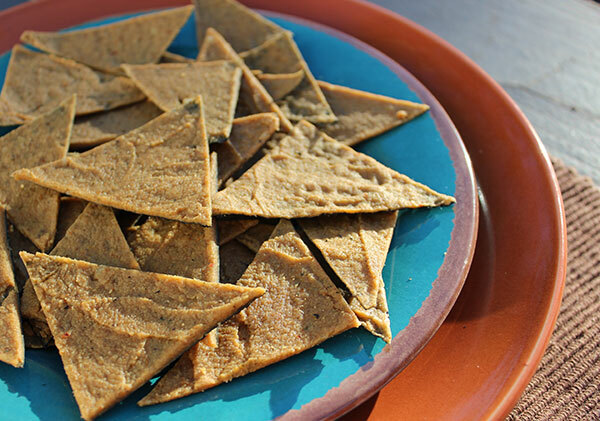 Some liken them to a raw vegan recipe version of the commercial tortilla chip "Doritos", often using the term "Noritos" to make the comparison. They are however not baked or fried or made with any kind of dairy products or artificial ingredients, nor do they really taste much like Doritos in our opinion... they are much, much better! Visit our nori nachos page for our recipe and helpful tips on how to make your own. We have literally been making sprouted rye crackers for over 15 years. They make a great filling yet energizing staple to have on hand in your pantry when you want a quick snack or convenient meal by adding seed cheese, avocado and sprouts. This recipe is a raw dehydrated replication of the traditional baked Swedish crispbread made from rye, salt and water. In our rye cracker crispbread recipe we also sprout the rye grains first to activate enzymes and beneficial nutrients. So, even though rye is typically a glutenous grain variety, sprouting it produces a much more digestible food and is typically much easier to assimilate for those usually sensitive to grains with gluten content. 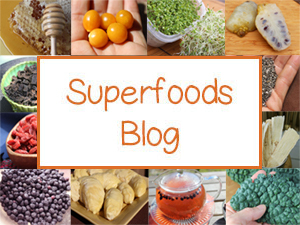 For those with extreme cases of celiac disease you can also use sprouted buckwheat instead of rye grain. Most people who like the taste of fermented sourdough breads, usually enjoy the slightly soured taste of these sprouted rye crackers. After the soaking and sprouting process, you will need a high speed processing or blending device to thoroughly break down the sprouted grains into a smooth pourable dough mix. This creates a wonderful cracker-crunchy texture. Many of you may be familiar with the American cracker brand "Cheez It's." Well, this is our version of them "raw-vegan style" using a nut and seed cheese blend that is dehydrated between 10-12 hours. 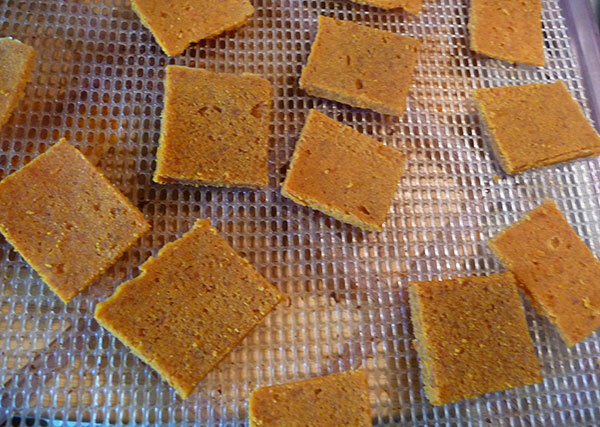 In this homemade cheez its recipe we also slightly ferment the cheese base beforehand to help predigest the nuts, making their amino acids and healthy fats available for easy absorption when consumed. These are crackers that look and taste like Cheez-It crackers, but without the processed cheese, gluten, preservatives and miscellaneous other non-pronounceable ingredients. Essentially, they are still the same cute little crackers but this variety is far more nutritious, enzyme active, made with whole foods and, as we mentioned, slightly cultured for a cheddar cheese-like flavor.